The Writing Greyhound: Why Should You Be Embracing Ethical Fashion? Saving the planet, going green, becoming more eco-friendly - these are all things we've heard before. But while you might think you're doing good for the environment by recycling and turning the tap off while brushing your teeth, have you thought about the impact your wardrobe could be having on the planet? Granted, this might well seem like a little bit of an over-reaction. After all, just how bad an impact can a bunch of clothes have, right? Well, as it happens, quite a bit, in fact. With the continually increasing rise of the Western throwaway consumerist culture, many of us buy cheap, poor-quality clothing items in bulk, barely wear them, then chuck them out soon after to be replaced with next season's models. It's wasteful, it's unnecessary, and it's got to stop. So, how can you make your wardrobe more eco-friendly? Many people swear by the trend of the capsule wardrobe, where you dress using only a few carefully-selected key pieces. Of course, sticking to a strict number might not work for some, but the idea is one which can be applied universally. Instead of buying ten budget shirts which are likely to fall apart after a few washes, why not spend your money wisely and invest in one higher-quality piece that is practical, stylish, and you can wear over and over again. Less waste, more care, and a slimmer wardrobe - what's not to love? On my recent quest for ethical fashion, I came across many shops and brands claiming to sell eco-friendly clothing. However, there was one small business which really stood out to me - the online clothing store called Living Life Our Way. This is a sustainable clothing range with a difference, offering charity pieces, clothing for all the family and the beautiful concept of enabling you to create bespoke clothing items to treasure using your little one's artwork. What a lovely idea! 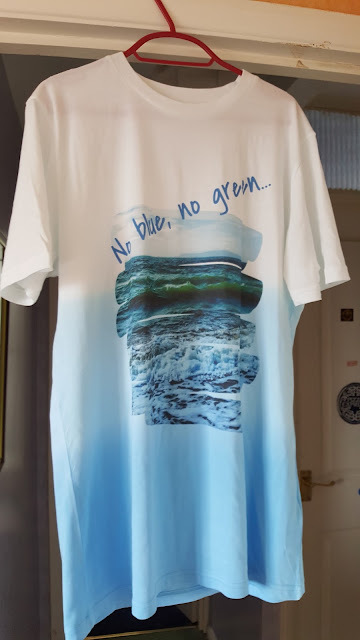 There are a number of pieces currently in the shop which I have my eye on, but the one which first caught my eye was the striking 'No Blue, No Green' design.Perfectly suited as an oversized statement tee for a relaxed look, the subtle colours make a real contrast with the shirt's message. 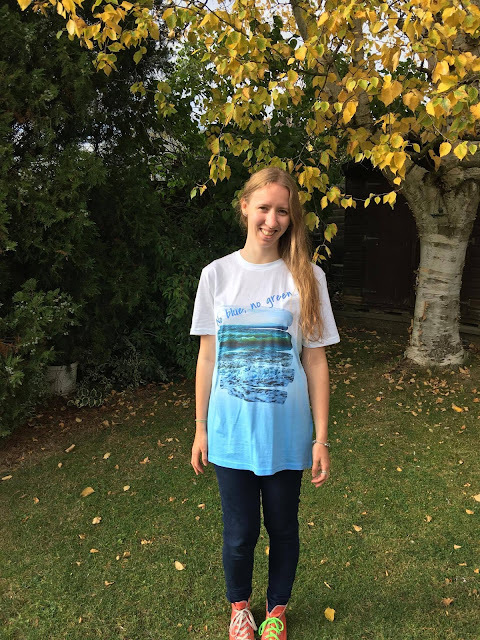 As it's a charity piece, 50p from each sale will go directly to ocean conservation organisations - the ideal way to help our oceans survive and do your bit for the future of our planet. I'm absolutely loving my tee and I'm sure this won't be the last time I visit Living Life Our Way! I'm also on the lookout for other new and exciting ethical fashion brands to try out, so if you have any suggestions, let me know your favourites! What do you think of the designs? Let me know in the comments below!